Kaltura is the video portal for University of Wisconsin System institutions. 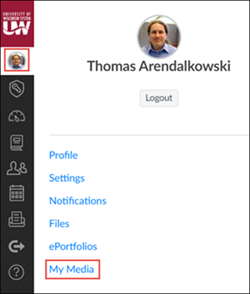 Instructors, students, and staff can use it to easily upload, store, stream, and share (or restrict) videos in Canvas. B) The rich text editor in any Page, Assignment, Discussion, etc. 1) Use My Media to upload a video file to your Kaltura account. From Canvas, go to Account > My Media. Go to any Canvas Page, Assignment, Discussion, etc, which allows you to edit text. 1) Click Edit or Reply to open the text editing view. 2) In the rich text editor, go to the v-shaped External Tools drop-down, then My Media. 3) On the My Media page, go to Add New > Media Upload. 4) On the Upload Media page, click on Choose a file to upload, then browse your computer to select a video file. Kaltura can process most major video file types and formats. Upload time will depend on bandwidth and file size. Now your video is in Kaltura in Canvas! Use External Tools > My Media (from Part B, above) to embed your video in any Canvas Page, Assignment, Discussion, etc, which allows you to edit text.